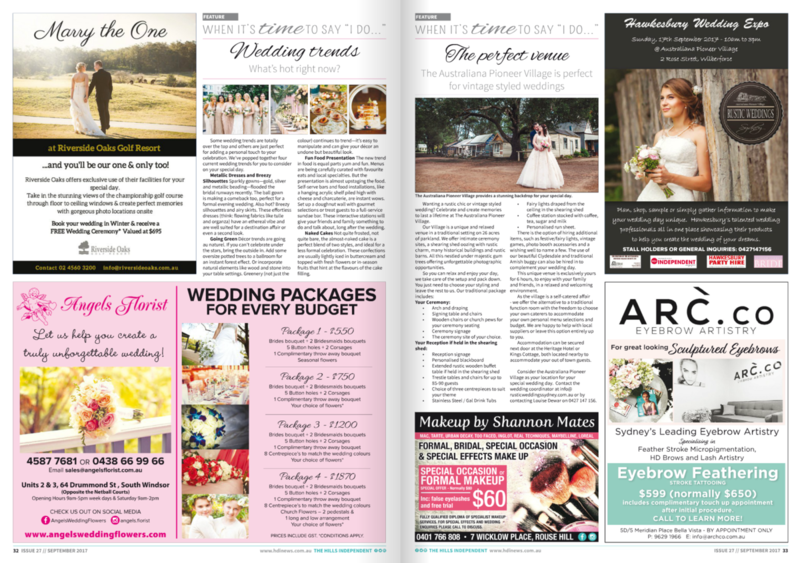 ARĆ.co are Sydney's leading eye couture specialists. 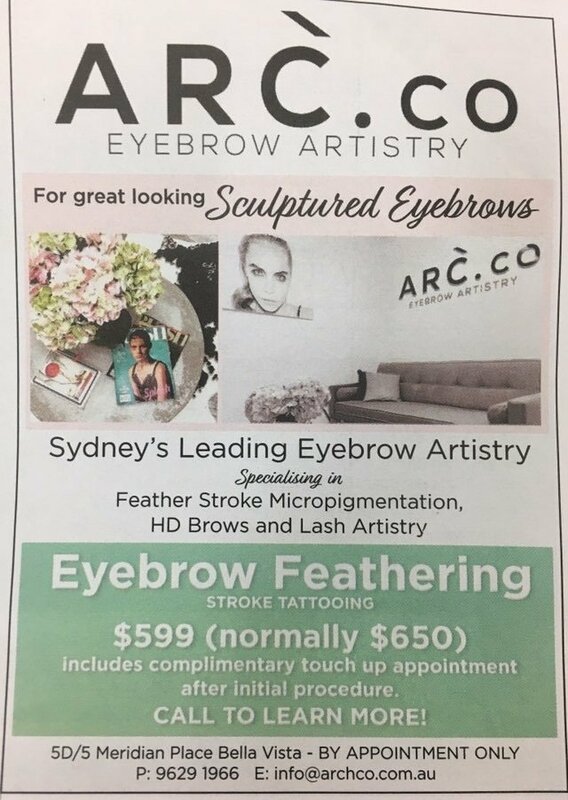 By focusing solely on their passion for this craft, they deliver outstanding, unmatched results in feather stroke micro-pigmentation, high definition brows and lash artistry. ARĆ.co was founded by Mariana Cummins, and epitomises chic elegance and sophistication in eye couture. 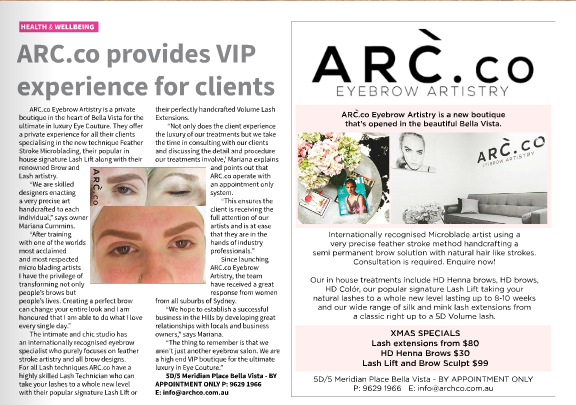 What sets ARĆ.co apart in this highly specialised industry is an implicit understanding that the perfect eyebrows need to strike an intricate balance between being both in vogue, yet timeless. Every client is unique, and so too are their brows. ariana is an internationally renowned PhiBrow artist, with a discerning aptitude for creating impeccable arches to frame and flatter a face, and a well-deserved reputation for excellence. Her prevalence in the industry is not by chance; it is a result of the dedication and commitment she shows to each and every client, lavishly indulging them with her time, talent and eye for detail. 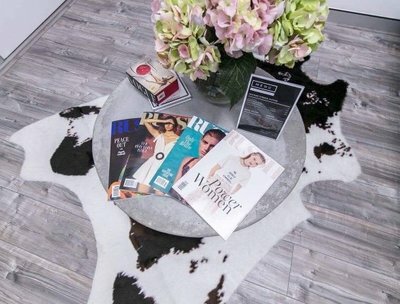 Mariana’s propensity to provide remarkable, innovative results is propelled by her commitment to remain current in the ever-changing and evolving cosmetic arena. 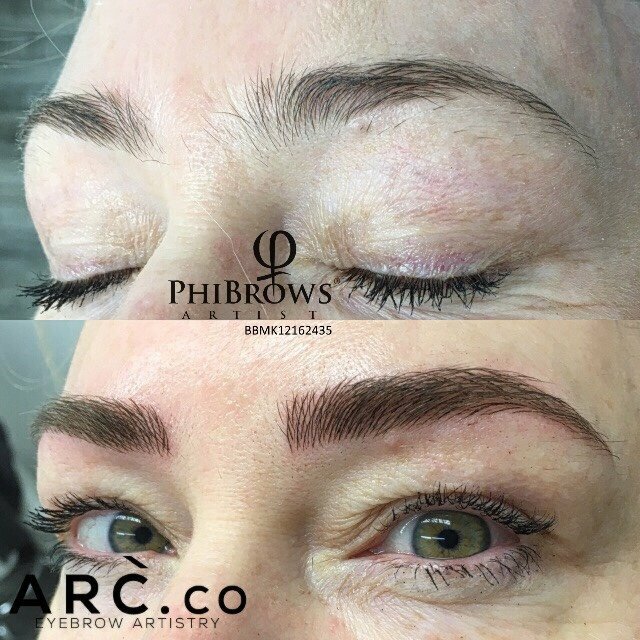 Unlike many other brow boutiques where you cannot be sure who will perform your procedure, at ARĆ.co you can be confident that the owner, Mariana, will personally tend to your brows to deliver individually customised and elegantly handcrafted brows that will enhance the natural beauty of your face. onia is the resident lash expert at ARĆ.co, specialising in Classic and Russian Volume Lashes, both of which are non-damaging to your natural lashes. By individually handcrafting each lash, she ensures the perfect lash-by-lash look every time. Whether you want to enhance your natural lashes or make a statement with bold, distinct lashes; Sonia will customise the lashes in accordance with your volume preference. icolette is a Registered Nurse. She graduated from University of Western Sydney and completed her New Graduate Program in the Intensive Care Unit. 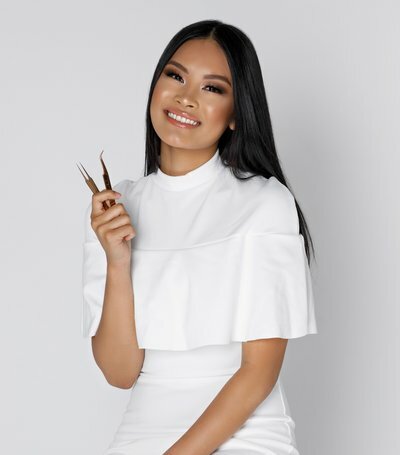 Realising that her desire to help people extended beyond them simply feeling good, but also looking their best too; she turned her attention to the cosmetic field and underwent additional specialist training in cosmetic injectables by one of the nation's leading experts in non-surgical solutions. 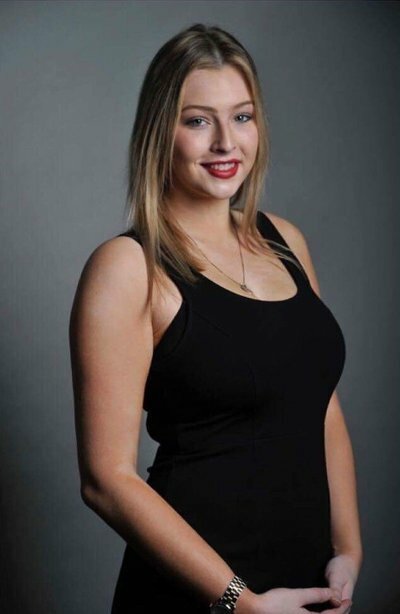 It is easy to feel confident with Nicolette's friendly personality, eye for detail and her commitment to ensuring natural looking results for her clients. 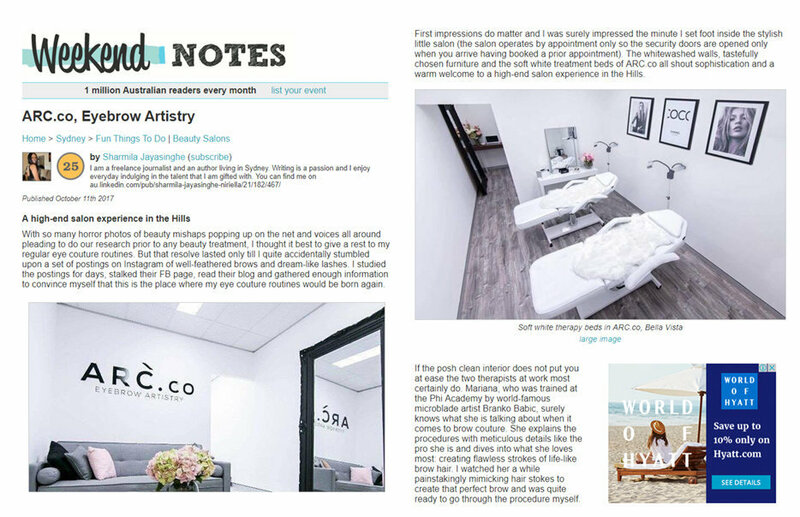 Upon entering this upscale boutique in Sydney’s Bella Vista, clients will immediately appreciate the affluent grandeur of the décor, and the peaceful, luxurious ambience; a fitting precursor to the high quality treatment that will follow. The white-washed walls and soft, white treatment beds immediately invoke a sense of calm and ease. Clients are sure to be impressed with the sophistication and comfort combined. This fresh and thoughtfully designed space is the perfect haven for clients to retreat to. 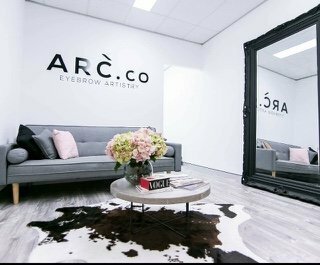 A private suite for luxury eye couture from our resident brow and lash experts, designed exclusively for ARĆ.co clientele. Using a combination of waxing and tweezing to maintain shape and tidy up brows. Our anti-wrinkle and dermal filler packages are customised to your specific facial concerns. Feather Stroke is the cornerstone of eyebrow artistry, where every stroke is thoughtful and intentional in sculpting customised eyebrows synonymous with style. 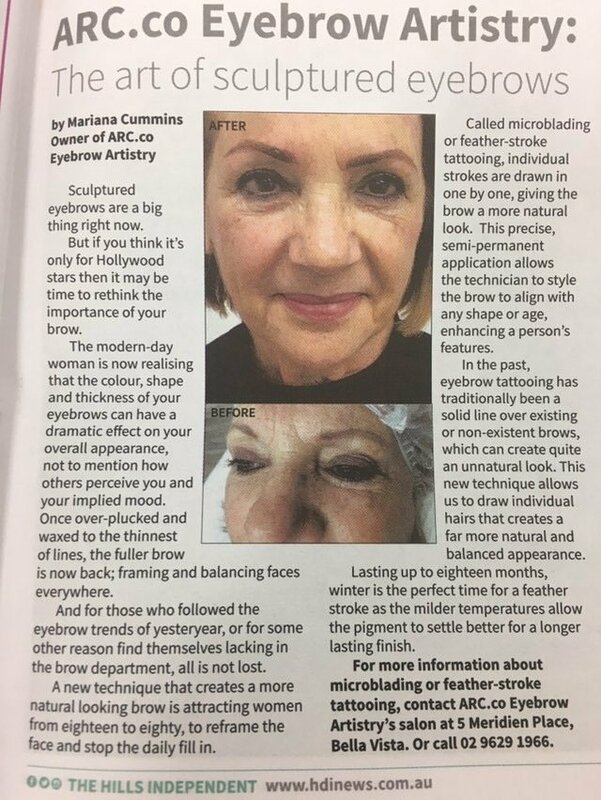 Mariana has unrivalled finesse in the feather stroke micro-pigmentation procedure, and her extensive training is backed by an exuberant passion for using this modish technique to create flawless, bespoke brows. Sparse or uneven eyebrows are transformed to become defined and symmetrical, with individual strokes that mimic the natural hair. The superior result is instant and long lasting. Taking your natural lashes to all new levels. A lash lift lasts 8 to 10 weeks and is ideal for those who don't want the maintenance of lash extensions. Accentuate your natural lashes or turn up the volume with fuller lashes. Be in complete control of your look by selecting from a wide range of beautiful lash styles, from the classic lashes through to 5D. Once you choose the lashes, our expert technician will make them look like they have been there all along. A high definition brow to create longer lasting colour on hair by using henna. Sculpting the desired shape with total precision by waxing, tinting, tweezing and trimming. Brows are mapped out and measured for symmetry. 'Absolutely thrilled with my results! This was my first ever experience with having a lash lift, it was easy, pain free and could give me better results than I could have expected! The after effect totally enhanced my whole look and opened up my eye and the best part is, is that it is using what I already have so I don't have to worry about glue or false lashes. Marianna was professional, warm and made the whole process comfortable. As a model and TV presenter my looks is what seals the deal for work, so I can't afford to have things to wrong on my face or body. "From the moment I walked into Arc.co I knew it was something special. Mariana and her team made me feel like royalty. No fuss, just exclusive service and talent - matched with smiles and expertise to go with it! It felt like a girls night out more than a beautiy service!" - Maha Wilson - Australian actress. "Before letting someone tattoo my face I did my research!! I had been looking for over a year at different artists feathering work but hadn't found the right company that made me feel completely comfortable. My eyebrows weren't bad, I just wanted a natural look to fill in some gaps. When I first saw Mariana's work it looked above the rest of the pack and I'm so glad I waited so long to make the right choice. Thanks Mariana for taking the time, being a perfectionist, listening to me and doing such a wonderful job!" "I've always had pathetic eyebrows and have had serious eyebrow envy of most people and try to savour when my make up gets done professionally because it's the only time my brows actually exist. I've been wanting to do something for a really long time and finally the eyebrow fairies answered my prayers and sent me to Mariana. She doesn't follow a template; she follows your face and does exactly what will suit you, not the same look for every person. This means that I'm not a clone. She keeps me an individual. I'm totally in love and the difference is phenomenal. x"
- Jess - Married at First Sight, Season 3. 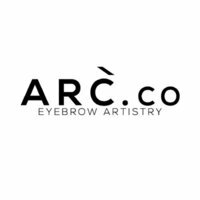 "Everyone brow down to the incredible Mariana @arc.co!! With my job I travel a lot, am constantly on the go and working with some pretty cool peeps, I need to ensure my brow game is strong! Bad brows mean bad business. Thank you beautiful girl for making me feel so confident and fresh as a daisy. - Sarah Louise - Executive Assistant to Michael Clarke Australian Cricketer. 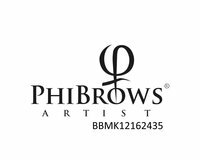 PhiBrows is the manual skill of semi-permanent eyebrow drawing. The shape of the eyebrow is calculated according to the golden intersection (phi 1.618) and face morphology. The pigment is applied into the surface layer of the dermis using sterilised tools. The pigment is chosen so as to match the natural colour of the eyebrow hair. After the healing, the colour may become several hues lighter than the colour of the natural hair. 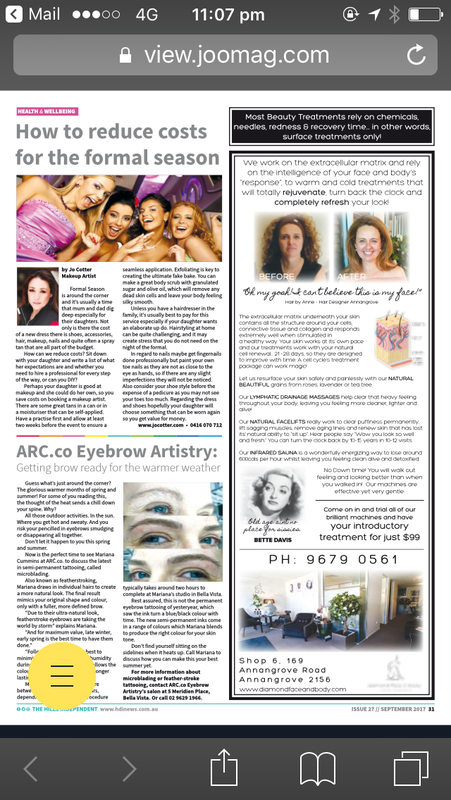 Symmetry is achieved through PhiBrows application. It is calculated while the client has their eyes closed because the mimetic muscles that can affect eyebrow symmetry are relaxed when the eyes are closed. Strokes are always drawn in the direction of natural hair growth to achieve a hyper-realistic look. Correction is done a month after the treatment to account for the 10 to 15 per cent of drawn strokes that disappear after the first treatment. Colour is extremely dark during the first 5 to 7 days. A week post treatment, it loses 40 to 50 per cent of its intensity. If you think the colour is too dark, do not try to remove it yourself under any circumstance. Patiently wait 7 days for the colour to fade on its own after the skin has healed. Colour duration primarily depends on how oily the skin is. The more oily the skin, the less time the colour will last. Sweating and sun exposure can also reduce the longevity of the colour. On average, expected time until a new colour refreshment is required is between 10 and 12 months. With oily skin it is approximately 6 months. Eyelash extensions are single synthetic lashes applied directly to the natural lash, close to (but not touching) the lash line, with a semi-permanent bonding adhesive. A single extension is applied to a single lash, leaving the eyelashes and eyelids to move freely and naturally. They are applied carefully, lash by lash, using tweezers specifically designed for the task. The entire process usually takes 1 to 2 hours, depending on how many lashes are applied. Russian volume eyelash extension can simply be defined as multiple (2 to 8) super fine lashes handcrafted into a fan shape, which is then applied onto a single natural lash (these are not clusters). This technique is used if the client wants a dramatic look or to simply fill in gaps within natural lashes. They are still considered to be individual eyelash extensions because they are applied to a single natural lash. The beauty about this technique is its ability to be able to turn multiple extensions into a fan to create extra volume (called the multi-lash pick up technique). Mastering this technique will allow you to create the most incredible eyelash extensions: anything from natural looking to extreme volume sets. This technique is especially great for clients with sparse natural lashes, giving them the opportunity to have thicker, longer and fuller lashes without damaging their natural lashes. We kindly request that you do not bring your children to an appointment without discussing this with us prior. As this is a salon environment, we have hot wax and other items that may harm a child when left unattended. Whilst you are having your treatment done, you will not be able to attend to your children and neither will our team. Our priority is the safety of your children. We appreciate your consideration in honouring this policy. Should you change or cancel your appointment within 48 hours of the scheduled time or fail to attend altogether, ARĆ.co reserves the right to charge a cancellation fee of 30 per cent of the treatment cost. If your appointments are pre-paid, you will forego a session of your prepaid program. With all appointments, a fee applies to secure your booking. Booking fee is non refundable.